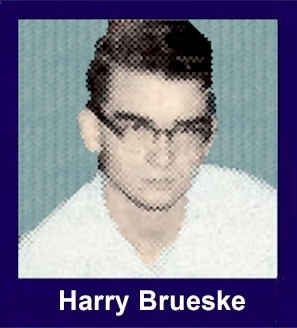 The 35th Infantry Regiment Association salutes our fallen brother, SGT Harry Dietrich Brueske, who died in the service of his country on January 22nd, 1969 in Pleiku Province, Vietnam. The cause of death was listed as Small Arms/AW. At the time of his death Harry was 21 years of age. He was from East St. Louis, Illinois. Harry is honored on the Vietnam Veterans Memorial at Panel 34W, Line 56. The decorations earned by SGT Harry Dietrich Brueske include: the Combat Infantryman Badge, the Silver Star, the Purple Heart, the National Defense Service Medal, the Vietnam Service Medal, the Vietnam Campaign Medal and the Vietnam Cross of Gallantry with Palm Unit Citation. abbreviated Minnie or Minna) who was listed as age 27 in 1951.His father, Hans, died on 1 Dec 1991 (born 1 Dec 1920. Harry attended East St Louis High School. The picture of Harry was from the 1965 Math Club. The web master for the that high school alumni site, Thurston A Criggler, graciously scanned the picture for us.